This is the Bison Football Team, c.1960. The photo was taken in the school assembly hall after a evening training session. They are (mostly) former pupils of Fawcett School in York Place Brighton. Surprise, surprise! On 23rd December I added a comment on the Carden Scool page re-calling my memories of the Friday night Pop club, that was created in 1960/1 in the school canteen for us youngsters to jive away to the latest pop records. That took my thoughts over school mates and local folk and the names of those I remember. Just a nice dream time. On the 24th December I was doing my daily browse through the ‘My B and H web’ and took the course on ‘local folk’. Having been on that page several times before I was excited to see a great deal more choices and went happily through those that appealed to me. Having no knowledge of football at all I deliberately passed the Bison Football Team photo several times until suddenly I got the impulse to open it up. The first thing my eyes fell upon was the tall young man standing centre back. This was one of those local friends who frequented the cafe at five ways and the local Carden pop club. That’s Tony, I said to myself, only half beliving my eyes after 47 years, and then read the names of the players at the top of the photo. In black and white — Tony Collier. Nice to confirn the brain cells still hold well what they want to hold. This web site is not just good. IT ROCKS !!! Thanks Sandra. Tony has mentioned that I was incorrect in naming Tich Freeman, his name is Dave Thompson also in the front on the right is Roy Cooper, and in the middle is Peter Ward. The first man on the front row is my dad David Round. Also he said: back row, 5th from left is Roger Wedge, and that middle row, 2nd from left is Kieth Mockford, not Roger (his brother). Hope this helps. Bottom line on the right is Roy Cooper who runs a butchers shop in Fiveways. Wedge, Mockford, Taylor, Long and Round were all members of the 1959 Fawcett School team that won both the League and Barlow Cup – the final being played at the Goldstone Ground after a Brighton & Hove Albion league match. It’s nice to see some of my old team mates, especially Roger Wedge, Kieth Mockford, Roger Long, Roger Taylor, and David Round. 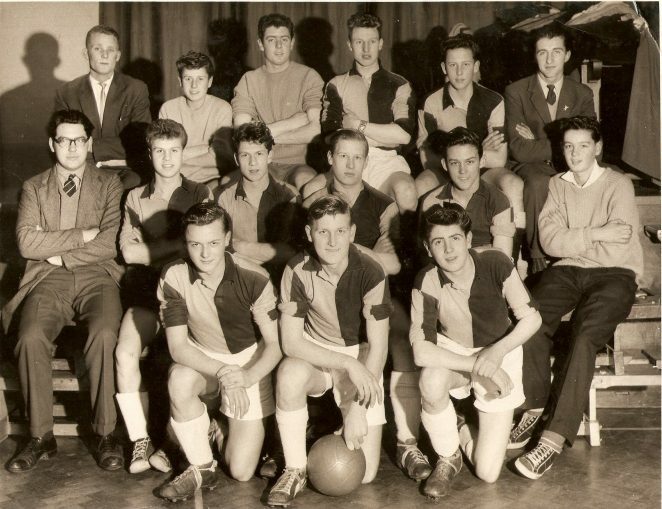 I know that 1958-59 Fawcett football team was the best thing that happened to me. I remember when I scored the winning goal in the Barlow Cup final at the Goldstone, David Round picked me up and carried my frame all the way to the half way line. I am still trying to find out if there is a photograph of that team. Raymond Ridpath in this picture is my father – he will be very pleased when he sees it. Also, it was the year of my birth so great for me to see a great photo of him. Will be passing it on to him and if anyone from the team wants to contact him he would be thrilled.